One of the most anticipated United States Supreme Court cases in many years for the education world has been Janus v. AFSCME, in which public-sector employee Mark Janus objected to being required to pay a representation fee (also called agency or fair share fees) to the American Federation of State, County, and Municipal Employees as a condition of employment. Not surprisingly, public-sector unions strongly supported AFSCME and many conservatives and libertarians supported Janus. The United States Supreme Court ruled today in a 5-4 decision in favor of Janus, meaning that public employees no longer have to pay anything to a union. (Previously, employees could get a refund of any expenditures not related to collective bargaining, but this refund was criticized by some as being only a portion of political spending.) Not surprisingly, the education Twittersphere (which tends to lean to the left politically) was immediately up in arms about the decision as being devastating to public-sector unions and education in general. But I take a different view in this post, explaining why the implications of Janus are likely to be fairly small for teachers even if unions take a major financial hit. The first reason the decision’s impacts are more limited is that 28 states already have right-to-work laws that ban public employees from having to join a union as a condition of employment. Arizona, Kentucky, and Oklahoma are three of these states—and all three saw massive K-12 teacher protests this spring for higher salaries (and with a fair amount of success). K-12 teachers are viewed fairly sympathetically by the general public—and far more so than higher education faculty. As I wrote earlier this year, the success of K-12 teachers in getting raises in right-to-work states may adversely affect higher education funding. Clearly, not being required to join a union does not mean that teachers cannot mobilize for higher salaries, and weaker unions may actually help the efforts gain support from conservative legislators. I also expect blue states to do everything they can to protect both K-12 and higher education faculty members post-Janus. Even though just seven states have unified Democratic control, Democrats have at least partial control in another 17 states. Teachers’ unions are likely to remain fairly powerful in these states even with diminished membership, and will be particularly powerful in local elections (where K-12 salaries are often determined). If anything, the most liberal states may do more to help teachers than in a world without Janus. Since nearly every state either already has right-to-work or at least partial Democratic control, I don’t expect to see big changes to K-12 or higher education salaries in response to Janus. Teachers’ unions will have to do a fair amount of belt-tightening to survive and work diligently to keep members (especially since joining a union looks to be opt-in instead of opt-out). But a union that is leaner and solely focused on compensation issues could end up being a very effective political player, particularly at the local level. Will The K-12 Teacher Walkouts Affect Public Higher Education? Perhaps the most interesting education policy development to this point in 2018 has been the walkouts by public school teachers in three states (Kentucky, Oklahoma, and West Virginia) that have resulted in thousands of schools being closed as teachers descended on statehouses to demand better pay. These job actions (which are technically not strikes in some states due to labor laws, but operate in the same way) have been fairly successful for teachers to this point. West Virginia teachers received a five percent pay increase to end their walkout, while Oklahoma teachers received a pay increase of about $6,000. Kentucky teachers had rather limited success, while Arizona is on the verge of a teacher walkout later this week. Given the success of these walkouts in politically conservative states, it is reasonable to expect K-12 public school teachers in other states to adopt the same tactics to increase their salaries or education funding in general. But what might these walkouts mean for public higher education? I present four possible scenarios below. Scenario 1: Future K-12 teacher walkouts are ineffective. It’s probably safe to say that legislators in other states are strategizing about how to respond to a potential walkout in their state. If legislators do not want to increase K-12 education spending and can maintain a unified front, it’s possible that protests die out amid concerns that closing schools for days at a time hurts students. In that case, expect no implications for public higher education. Scenario 2: Public college employees join the walkout movement. Seeing the victories that K-12 teachers have scored, faculty and staff walk out at public colleges in an effort to secure more higher education funding. While this could theoretically work, public support is likely to be much weaker for colleges and universities than K-12 teachers. Republicans in particular now view college professors far more skeptically than Democrats, while the two parties view K-12 public schools similarly. So this probably won’t work too well in conservative states. Scenario 3: Future K-12 teacher walkouts are effective—and paid for by tax increases. Oklahoma paid for its increase in teacher salaries by increasing taxes in a number of different areas, although teachers wanted a capital gains tax exemption to be eliminated. This probably reduces states’ ability to raise additional revenue in the future—which could affect public colleges—but the immediate effects on public colleges should be pretty modest. Scenario 4: Future K-12 teacher walkouts are effective—and paid for by reducing state spending in other areas. This is the nightmare scenario for public higher education. Higher education has traditionally been used as the balancing wheel in state budgets, with the sector being the first to experience budget cuts due to the presence of tuition-paying students. Therefore, in a zero-sum budget game without tax increases, more K-12 spending may come at the expense of higher education spending. West Virginia paid for its teacher pay increase this year in part by cutting Medicaid spending, but don’t expect most states to take that path in the longer term. To sum up, the higher education community should be watching the K-12 walkouts very closely, as they could affect postsecondary students and faculty. And there may end up being some difficult battles in tax-averse states between K-12 and higher education advocates about how to divide a fixed amount of funds among themselves. Author RobertPosted on April 19, 2018 Tags budget, faculty, politics, states1 Comment on Will The K-12 Teacher Walkouts Affect Public Higher Education? For most American college students, the non-tuition portions of the cost of attendance (room and board, books and supplies, and a miscellaneous expenses category) are larger than tuition and fees. Colleges can set these estimates as they deem fit, and previous research by me, Sara Goldrick-Rab of Temple University, and Braden Hosch of Stony Brook University shows a large amount of variation in living allowances among colleges in the same geographic area. This means that similar students can access different amounts of financial aid—and that colleges with the same tuition price can look much different in a range of accountability measures. As the U.S. Department of Education currently does not provide guidance for colleges in setting these allowances (and Higher Education Act reauthorization looks increasingly unlikely in 2018), it is worth exploring whether states should step in and provide some assistance for their public colleges and universities. In the two blog posts below, I teamed up with David Tandberg of the State Higher Executive Officers Association and Sarah Pingel of Education Commission of the States to further examine the topic. We would love to hear your thoughts on this issue, so send them along! One of the most appealing aspects of tuition-free higher education proposals is that they convey a simple message about higher education affordability. Although students will need to come up with a substantial amount of money to cover textbooks, fees, and living expenses, one key expense will be covered if students hold up their end of the bargain. That is why the results of existing private-sector college promise programs are generally promising, as shown in this policy brief that I wrote for my friends at the Midwestern Higher Education Compact. But free college programs in the public sector often come with a key limitation—the amount of money that the state has to fund the program in a given year. Tennessee largely avoided this concern by endowing the Tennessee Promise program through lottery funds, and the program appears to be in good financial shape at this point. However, two other states are finding that available funds are insufficient to meet program demand. Oregon will provide only $40 million of the $48 million needed to fund its nearly tuition-free community college program (which requires a $50 student copay). As a result, the state will eliminate grants to the 15% to 20% of students with the highest expected family contributions (a very rough proxy for ability to pay). New York received 75,000 completed applications for its tuition-free public college program, yet still only expects to give out 23,000 scholarships. Some of this dropoff may be due to students attending other colleges, but other students are probably still counting on the money. In both states, a number of students who expected to get state grant aid will not receive any money. While rationing of state aid dollars is nothing new (many states’ aid programs are first-come, first-served), advertising tuition-free college and then telling students they won’t receive grant aid close to the beginning of the academic year may have negative effects such as choosing not to attend college at all or diminished academic performance if they do attend. There is a sizable body of literature documenting the “disappointment effect” in other areas, but relatively little in financial aid. There is evidence that losing grant aid can hurt continuing students, yet this does not separate out the potential effect of not having money from the potential disappointment effect. The Oregon and New York experiences provide for a great opportunity to test the disappointment effect. Both states could compare students who applied for but did not receive the grant in 2017-18 to similar students in years prior to the free college programs. This would allow for a reasonably clean test of whether the disappointment effect had any implications for college choice and eventual persistence. Although tuition-free public college will not become a federal policy anytime soon, more states and local communities are considering different variations of free college. There are nearly 200 active college promise or free college programs in the United States, with two states (Arkansas and New York) enacting tuition-free programs in recent weeks. New York’s Excelsior Scholarship program has garnered quite a bit of attention because it covers students at four-year colleges (most larger programs are limited to less-expensive two-year colleges), because of the conditions attached, and because New York governor Andrew Cuomo is likely to run for president in 2020. Yet the ambitious program (the legislation text starts on page 142 of this .pdf) also has to overcome a number of challenges in order to be truly effective. I discuss three of the key challenges with this program below. Challenge 1: Will scholarship funds be available to all qualified students? The budget includes $163 million in funding for the program, which is probably far below the amount of money needed to fund all students. Judith Scott-Clayton of Teachers College estimated that an earlier version of the program could cost about $482 million per year. Even requirements that students complete 30 credits per year and clawbacks for students who leave the state after graduation (more on that later) may not bring the cost down enough—particularly if the program is successful in increasing enrollment at public colleges. The budget has a provision that allows awards to be cut or allocated via lottery if funds run short, which is a distinct possibility if the state faces another recession. Needless to say, this would be a PR nightmare for the state. 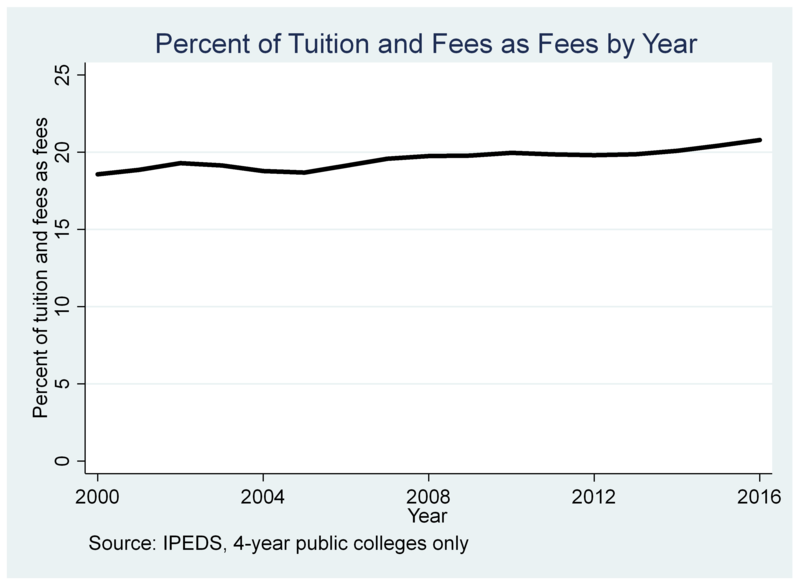 Challenge 2: Will colleges use fees as a tuition substitute? A full-tuition scholarship sounds great, but students and their families often forget about fees. 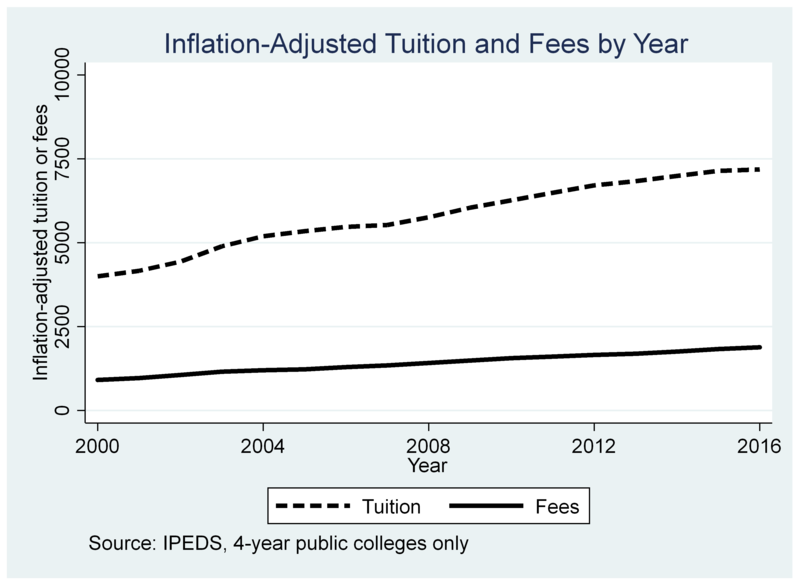 Right now, fees are a sizable portion of direct educational prices. For example, at SUNY-Albany, tuition is $6,470 and fees are $2,793, while Hostos Community College charges $4,800 in tuition per year for a full-time student alongside $406 in fees. Since the scholarship only covers tuition, the state may pressure colleges to increase fees in an effort to reduce program costs. This happened in Massachusetts for years and still happens in Georgia, both states with large merit-based grant aid programs. Over time, it is quite possible that the value of the grant fails to keep up with inflation as a result—particularly if the state shifts funding from appropriations to student aid and colleges scramble for another revenue source. Challenge 3: Will the state be able to manage a large “groan” program? Perhaps the most controversial portion of New York’s program is the requirement that students must live and work in the state after college for the same number of years that they received the grant; if they fail to do so, the grant converts to a loan (also known as a “groan” to financial aid wonks). Many people have raised concerns about the fairness of this idea, but here I’ll touch on the logistics of the program. Can the state of New York track students after graduation and see where they both live and work? Will they feel pressures to exempt students who live out of state but work in New York and pay state income taxes? What will the terms of the converted loans look like? There are a lot of unanswered questions here, but it is clear that the state must invest in a larger student loan agency in order to manage this complex of a program. As Governor Cuomo prepares for a likely presidential bid in 2020, he is counting on the tuition-free college proposal to be one of his signature policy ideas. Some of the biggest concerns with this legislation may take years to develop, but even a period of two or three years may be enough to see whether the program can work effectively around some of the significant concerns noted here. How Should States Structure “Free” College? It is safe to say that the idea of free public college has gone dormant at the national level with the election of Donald Trump and a Republican Congress. But a number of states are considering adopting free college plans in light of the Tennessee Promise’s success from both political and enrollment perspectives.1 According to the Education Commission of the States, legislation was introduced in 23 states to adopt some type of free college plans between 2014 and November 2016. These bills died in most states, but five states in addition to Tennessee (Delaware, Kentucky, Minnesota, Oregon, and Rhode Island) enacted free college plans during this period. On the same day that Republicans officially took control of the U.S. Senate, New York’s Democratic governor Andrew Cuomo announced a proposal to make SUNY and CUNY institutions tuition-free for students with family incomes below $125,000.2 This proposal, which Cuomo introduced alongside Vermont senator Bernie Sanders, would make public colleges tuition-free as a last-dollar scholarship. This appears to be similar to the Tennessee Promise, in which additional state funds are applied only after federal, state, and private grants are used. While President Obama’s free community college proposal would have been a first-dollar scholarship (supplementing instead of supplanting other aid), Cuomo’s plan would keep the price tag down to about $163 million per year—an important consideration given the state’s other pressing priorities. Because New York is a low-tuition, high-aid state, the neediest students already have their tuition covered by grants and would thus receive no additional funds. Therefore, the benefits of the program would go to two groups of students. The first group is fairly obvious: middle-income and upper-middle-income families. In New York, $125,000 falls at roughly the 80th percentile of family income—an income level where families may not be able to pay tuition without borrowing, but college enrollment rates are quite high. The second group consists of lower-income students who are induced to enroll by the clear message of free tuition, even though they would have received free tuition without the program. Tennessee’s enrollment boost suggests this group is far from trivial in size. Students attending New York public colleges currently have fairly modest debt burdens. College Scorecard data show that the median student attending public 2-year colleges graduates with about $10,000 in debt, while students at 4-year colleges graduate with about $20,000 in debt. Will the New York program (if adopted) make a sizable dent on students’ debt burdens? My expectation is that the reduction in debt will not be as much as expected. This is because tuition and fees are less than half of the total cost of attendance at four-year colleges and an even smaller fraction at community colleges. Students will still need to borrow for books and living expenses, which are not covered in Cuomo’s proposal. This gets back to a seemingly-eternal question in the education policy realm. Given limited resources, is it better to give more money to the neediest students to help them cover living expenses or is it better to give some money to middle-income families in a state with high tax burdens?3 Most politicians seem to prefer the latter, as the message of “free” college and giving money to more students seems to be a political winner. But the former could appeal to politicians who strongly prioritize equity. But from a researcher’s perspective, which one is better for students as a whole is less clear. (It could even be the case that giving the money to colleges to improve the educational experience while charging higher tuition could be better for students in the long run.) One great thing about America is that there are 50 laboratories of democracy. I hope that states take different pathways in student financial aid and funding colleges to see what works best. 1 It is too early to truly tell whether the program increased educational attainment levels or labor market outcomes, or whether the program has been cost-effective given additional state funding for higher education. 2 I have to gripe about the language in the press release regarding “crushing” student loan debt, particularly given how students can use income-driven repayment plans to reduce the risk of federal loans. But I’m spitting into the wind on this one, given how journalists and politicians routinely use this language that could scare students away from attending college. 3 Some may disagree with the idea that resources are limited, but former White House staffer Zakiya Smith summed it up nicely by stating that there are plenty of other good uses for available funds in any budget. Author RobertPosted on January 3, 2017 Tags debt, financial aid, states1 Comment on How Should States Structure “Free” College?